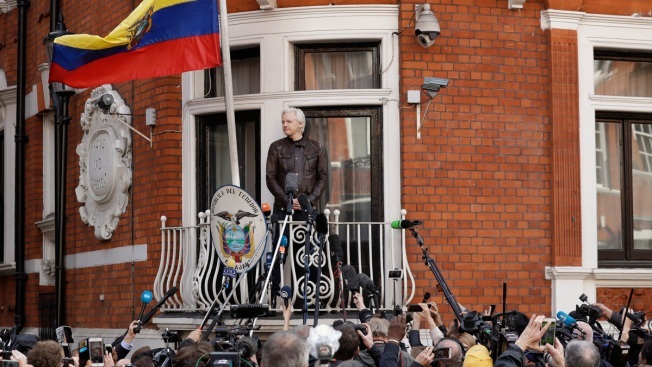 In this file photo dated Friday, May 19, 2017, WikiLeaks founder Julian Assange, watched by the media, looks out from the balcony of the Ecuadorian embassy prior to speaking in London. Ecuador has denied WikiLeaks' claims that it is set to expel Julian Assange from its embassy in London, rejecting what it called "an attempt to stain the dignity of the country," NBC News reported. Assange, the founder of WikiLeaks, hasn't left the embassy since 2012. He sought refuge there to avoid arrest and potential extradition to the United States for publishing thousands of classified military and diplomatic cables on the website. The organization has also repeatedly claimed that the U.S. Justice Department is building a criminal case against Assange centered on the leaking of Democratic emails hacked by the Russians in the 2016 election. On Friday, WikiLeaks tweeted that Assange would be expelled from the embassy "within 'hours to days'" and claimed that Ecuador "already has an agreement with the UK for his arrest." Ecuador's Ministry of Foreign Affairs said in a statement late Friday that Assange and WikiLeaks have shown "ingratitude and disrespect" toward the country that has given him protection on its diplomatic soil by fueling rumors that he would be handed over to British authorities. Ecuador "has made significant expenditures to pay for his stay" and has "endured its rudeness," the ministry said.